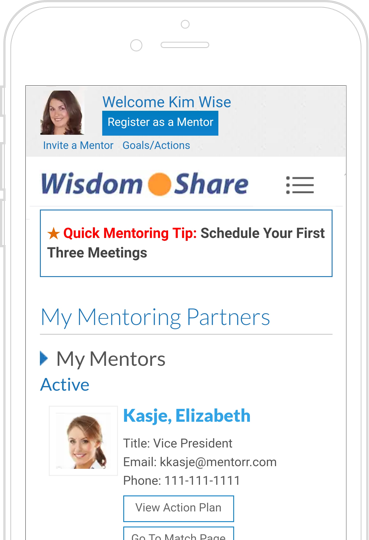 Wisdom Share helps Fortune 1000 companies, universities, government agencies and non-profits launch robust mentoring programs utilizing best practices. Based on 18 compatibility factors and 30 years of expert matching experience, it provides 99% satisfaction ratings. Guide participants through the mentoring process with milestone calendar tied to rich content and email alerts. Create and monitor customized goals and follow along with personalized milestones throughout relationship. Best practice webinars, an online library of guides and resources, drip emails with the right instruction and support at the right time. Partners can message each other and share files, colleagues can participate in an open discussion board, and badges and awards gamify the process. Dashboards, summary reports, in-depth analyses, surveys, and more - all the tools needed to easily administer a successful mentoring program. We are not exclusively a software company. We are an online mentoring program and expert matching company with industry expertise that is powered by world-class software. We empower you with what you need to empower your participants: tips, tools, best practices, ideas and results. Contact us today to learn about our solution. Contact us later so we can help you get the most of your solution. to see how this innovative software can help your organization.